Blockchain, cryptocurrencies, and central banks: Opportunity or threat? Internet-based technology has made it cheap to collect information and to network. 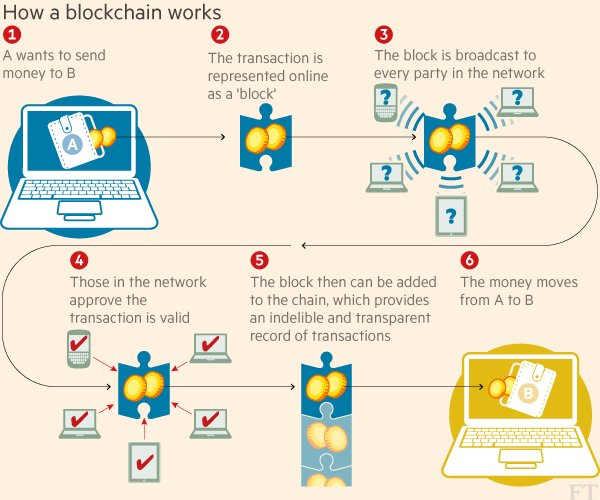 Blockchain technology undermines the 'middle-man' business model. It makes it harder to cheat in transactions, and so reduces the value of credibility lent by trusted intermediaries. It is less important that counterparties may not know and trust each other. A lack of trust becomes less of an impediment to trade. This opens up new possibilities for financial market participants. Getting rid of middle-men saves cost, speeds clearing and settlement (possibly easing capital requirements), and reduces operational risks. It can also help to implement tailor-made transaction protocols, or to keep transaction details confidential while at the same time providing records for supervisors. Maybe most importantly, it improves the bargaining power of buyers and sellers when they deal with brokers. If you are in the intermediation business, this is worrying. Consider first the rise of cryptocurrencies and the currency competition that derives from it. Cryptocurrencies have a fundamental advantage, which is the power to commit using 'smart contracts'. Unlike the supply of fiat monies that hinges on discretionary decisions by monetary policymakers, the supply of cryptocurrencies can, in principle, be insulated against human interference ex post, and at the same time be conditioned on arbitrary verifiable outcomes. Cryptocurrencies have the potential to overcome commitment problems that have long been at the heart of monetary policy, for example by having a smart contract fix the growth rate of the virtual currency subject to clearly defined escape clauses. Currently, however, the issuing bodies of most cryptocurrencies do not make use of this possibility. Like traditional monetary authorities, they allow discretionary interference by their respective 'monetary policy committees' instead. Blockchain-facilitated transactions denominated in domestic currency may affect central banks much faster and more directly. Consider a security purchase paid with domestic currency using the blockchain. The change of ownership of the security may go hand-in-hand with an exchange of claims on domestic currency (the seller’s account at a bank participating in the blockchain is credited, for example), or of actual central bank money (following Koning 2014, we might call this 'Fedcoins'). In the former case, payment eventually requires clearing through traditional central bank managed channels, at the cost of added complexity and resources. In the case of Fedcoins, it doesn’t. If base money 'lives' on the blockchain, the buyer can directly transfer domestic currency to the seller. Transfer of ownership of the security and of central bank money may then occur jointly, in real time. Central banks increasingly are under pressure to keep ‘their’ currencies attractive. They should let the general public access electronic central bank money, not just financial institutions ( Niepelt 2015). To do this, they should embrace the blockchain. Economist (2016), "Redistributed ledger", 19 March. Koning, J P (2014), “Fedcoin,” Moneyness blog, 19 October. Niepelt, D (2015), “Reserves For Everyone—Towards a New Monetary Regime?,” VoxEU, January 21. Raskin, M and D Yermack (2016), “Digital Currencies, Decentralized Ledgers, and the Future of Central Banking,” NBER Working Paper No. 22238.